Libratone expands wireless speaker family with portable GO series | What Hi-Fi? The new range comprises three battery-powered, Bluetooth speakers, and sits beneath the brand's Zipp line. Libratone has garnered well-earned praise from us over the years for its decent-sounding, unique-looking wireless speakers. Of late, the Scandinavian company’s focus has been on its multi-room, wi-fi Zipp and Zipp Mini speakers. But the new GO series, which launches today, goes back to basics by introducing more affordable, on-the-go models to the line-up. The Libratone ONE Click, ONE Style and TOO feature the brand’s signature 360-degree sound and Scandinavian aesthetics, and promise 12 hours battery life from a single charge (via micro USB). There is also a 3.5mm input for wired listening. Thanks to Bluetooth + 1 technology and Libratone’s free app, two can be linked together, or one can be paired with a Zipp or Zipp Mini, to play in stereo or unison. All three speakers have a metal mesh chassis, which features the familiar – and intuitive – touch interface found on the Zipp speakers, and is splashproof to IPx4. The flagship Libratone ONE Click (£139) is a 40-watt speaker featuring a 3in woofer, 1.1in tweeter and two passive drivers. The book-shaped speaker has a modular design, with a removable rubber frame catering for two interchangeable handles: a hook and a carry strap. Libratone has included rubber ‘bumpers’ along the frame for extra ruggedness. Next up is the Libratone ONE Style (also £139), which is essentially the same as the ONE Click, but instead of accommodating multiple handle covers, has a single removable rubber frame with a standard finger loop design. The 25-watt Libratone TOO (£109) is the smallest in the series, shaped like a water bottle and featuring twin 1.5in full range drivers and a single passive driver. 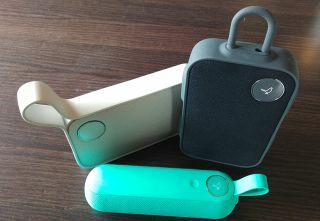 The Libratone ONE Click, ONE Style and TOO come in graphite grey, cloudy grey and caribbean green, and are available today from Libratone.com. Currys, John Lewis and Amazon also plan to stock them by mid July.